• Reinforce the gasket surfaces. • Erosion of graphite material is prevented at high fluid velocity – and subsequent contamination of media – when fitted to gasket inner surface. • Reduce danger of overcompression at high seating stresses. 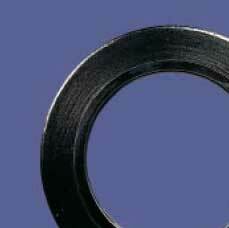 • Improve ease of gasket handling. Generally as quoted for the Supagraf® grade to be used.